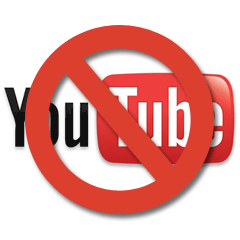 YouTube, the popular Google-owned video sharing site, has announced it will block access to UK residents wanting to watch online music videos. The statement was issued after the company failed to agree new licensing terms with the Performing Right Society (PRS). The PRS collects royalties on behalf of 50,000 composers and artists. The organisation was negotiating a new deal with YouTube that is rumoured to be many times more than the previously agreed terms which expired recently. Both parties blame each other for the breakdown. We feel we are so far apart that we have to remove content while we continue to negotiate with the PRS. We are making the message public because it will be noticeable to users on the site. The costs are simply prohibitive for us – under PRS’s proposed terms we would lose significant amounts of money with every playback. We were shocked and disappointed to receive a call late this afternoon informing us of Google’s drastic action. Whatever the outcome, the only clear losers at this time are the UK public. Is this a last desperate attempt from the ‘old’ economy to hold on to power? Or can we expect increased litigation from the traditional distribution channels against new media companies? The web is a worldwide network; can organisations realistically dictate what individual territories are permitted to view when it is technically possible to bypass those restrictions?